Company Nameplates / ID Plates / Property Tags / Badges | | Industrial Marking Services, Inc.Industrial Marking Services, Inc.
Company Nameplates / ID Plates / Property Tags / Badges - Industrial Marking Services, Inc.
Nameplates identify a company or product name. The medical, aerospace, military, manufacturing, and telecommunications industries rely on nameplates for inventory and identification purposes. Serial codes and other information for inventory control purposes are often part of the nameplate. Other mandatory requirements such as UL, CSA & MET logos must be on nameplates and must be provided by a UL, CSA or MET approved printer such as Industrial Marking Services, Inc. Most nameplates need to meet certain requirements for print life as well as environmental tolerances based on the location or environment the product will be used in. There are several materials that can be used in making nameplates such as aluminum, polycarbonate and polyester. Industrial strength nameplates are required to withstand harsher operating environments compared to those used in the home and office. 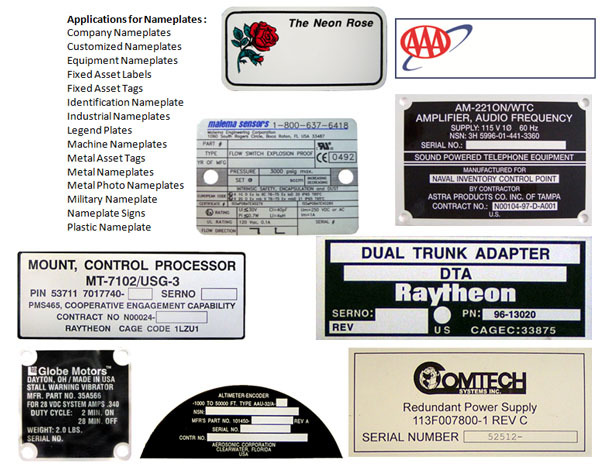 All industries that require long term product identification or marking use nameplates. Industrial Marking Services offers a variety of different nameplates for a wide range of applications. The properties of a name plate can vary from application to application and include: Material, thickness, graphics, screen printing, adhesive backing, UL and CSA approval, serialization and military standards.